Simply Crochet is full of creative ideas for anyone who loves - or would love to learn - crochet. Crochet is a wonderfully versatile craft with endless possibilities of creative things to make. Inside you will find beautiful designs for the home, fashionable accessories to wear and gift ideas for all occasions. 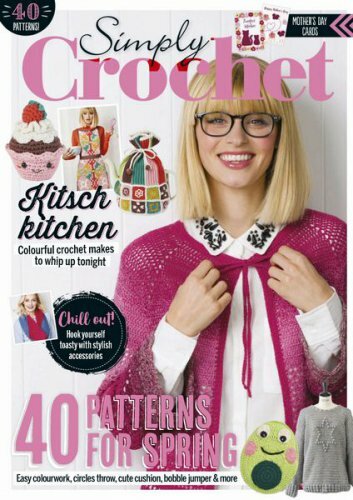 From lampshade covers to shawls, toys to blankets and gadget cosies to cardigans, Simply Crochet is a must-buy for creative crafters looking for new things to make. With clear, easy-to-follow instructions to ensure the best possible results every time, you'll be hooked on handmade from the very first page! Журнал "Simply Crochet" посвящён вязанию крючком. В каждом выпуске этого журнала представлены проекты для вязания моделей одежды для взрослых и детей, аксессуаров, игрушек, предметов интерьера для дома. Кроме этого, журнал предлагает интересные статьи о мастерах вязания, обзоры пряжи и журналов по вязанию, новости и события в мире вязанной моды.